During a trivia game a few years ago, I was asked what waterway bypasses Niagara Falls. The answer is the Welland Canal, a twenty six mile channel that winds from Lake Ontario up to Lake Erie. I knew the answer right away, for an atypical reason – I’ve gone through it. And a few days ago, I went through it again. If you’ve been around the maritime industry for a year or two, you’ve probably heard of the Welland Canal. A series of eight locks operate as a floating stairway to lift and lower vessels over three hundred feet. Cargo vessels built halfway around the world are constructed to the dimensions of the Welland Canal locks. It takes seven to seventeen hours to get through the locks, primarily based on traffic, and often requires all hands on deck to manipulate docklines and fenders. On Monday morning, the crews of Unicorn and Pride of Baltimore II woke shortly after five and got underway for Port Welland. The other boats would follow later that day. We collected every fender on board and lashed them over the sides. They would absorb the shock and protect the boat if we made contact with the lock walls. We then lashed newly created “Welly-boards” outboard of the fenders. These sacrificial chunks of lumber slide up the lock walls as the boat rises. 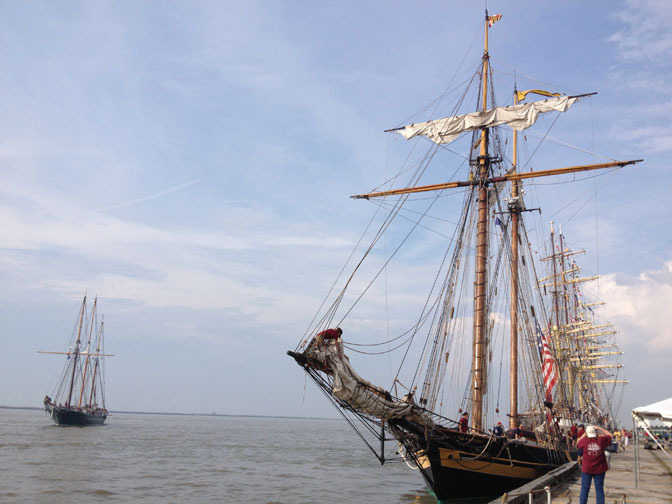 Some tall ships even add a second layer of sacrificial wood, nicknamed “spuds”. If there is still a great deal of friction as the vessel grinds up the lock wall, a crew member may be sent to take the cook’s container of Crisco and be told to slather grease all over the fenders. Having accomplished this duty for Lynx, a Crisco-covered crewmember earned the nickname Crisco Man! We reached the first lock around 0800 and were lucky to find a green light, signaling us to enter. The Captains took the helms and skillfully steered into a towering, cement box. One of the most remarkable features of the locks is their immense size. Only more remarkable is the size of the cargo vessels that traverse them. Lines were tossed down from the top of the lock wall, nearly forty feet above our heads. We hitched these lines to our sturdy docklines so that workers on the dock could haul our docklines up and loop them around bollards. Once we were secure, enormous wood and metal gates slammed shut behind us and water started pouring into the lock. We had requested a slow fill but the turbulence in and beneath the water rocked the boat. 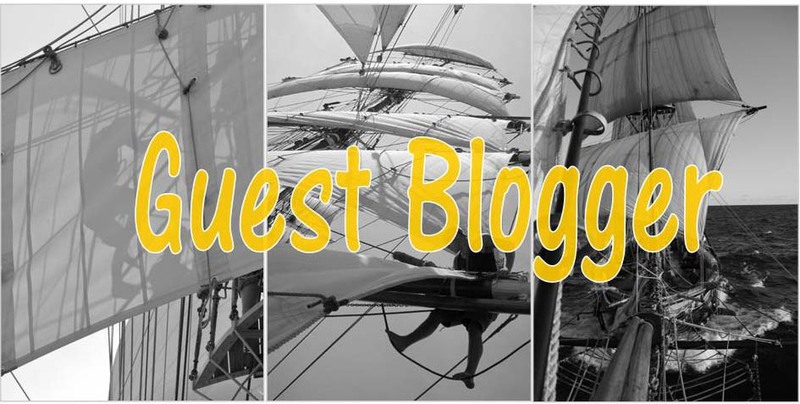 At the Captain’s orders, deckhands aboard eased and took up slack in the docklines, enabling us to maintain our position as we quickly rose to dock level and cheering bystanders appeared through the chain link fences at the edge of the cement dock. Finally, the water settled. Ahead, the thick gates rumbled open and we glimpsed flashes of green grass and trees and murky, blue, canal water. Slipping off the dock and out of the lock, the crew breathed a sigh of relief and collapsed on the deckboxes, exhausted. One down, seven to go. 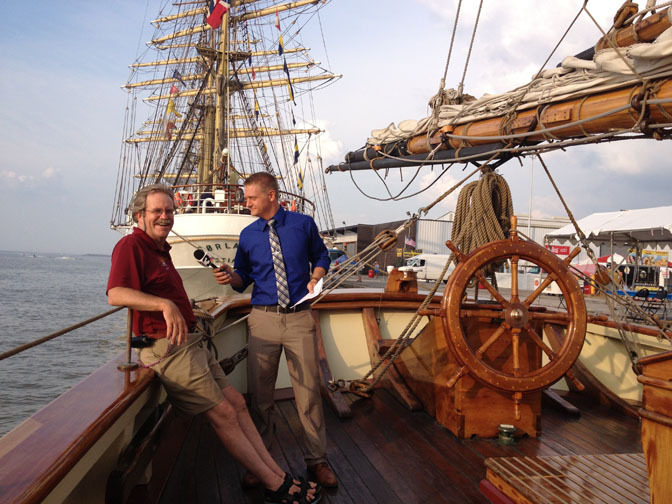 It seems every time the tall ships arrive in Cleveland, they bring the heat. Yesterday was no exception. As the temperature rose, and we sought out any shade we could find, those of us on site waiting for the ships agreed that yes, it was hot, but not as hot as 2010. Small consolation when you are standing on the boat deck of a steel steamship called the William G. Mather. 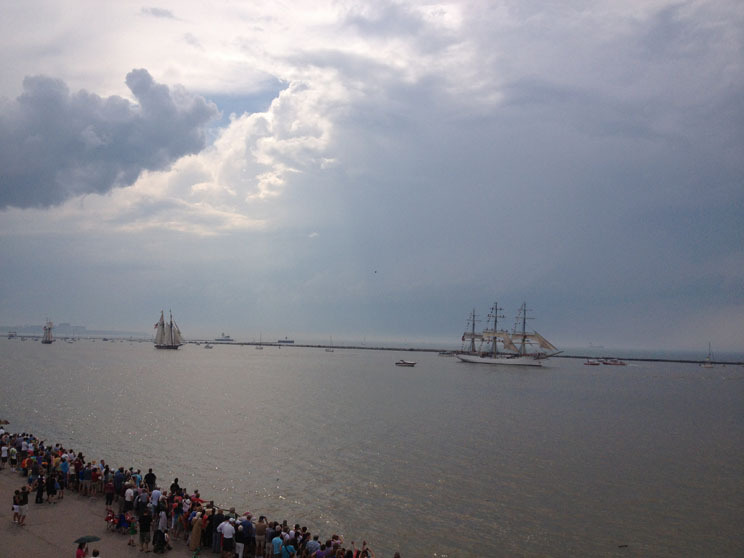 But what made up for the heat was the fact that we had the best seat in the house for watching the parade of tall ships arrive into the first U.S. port of the TALL SHIPS CHALLENGE(r) Great Lakes 2013 Race Series. 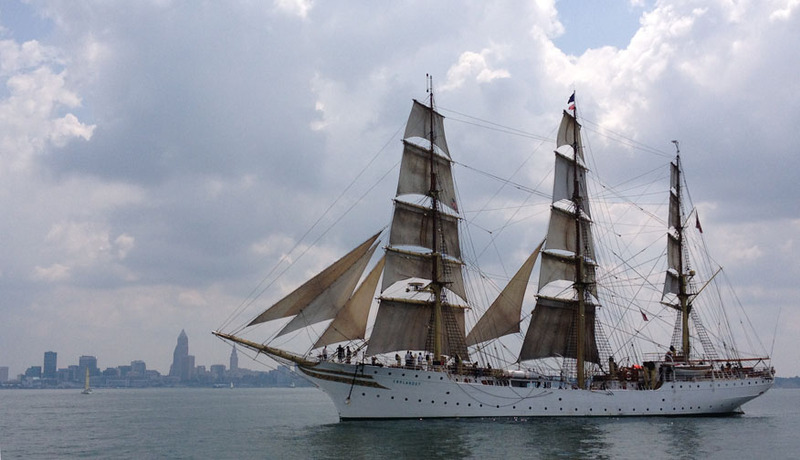 The Port of Cleveland 2013 Tall Ships(R) Festival, presented by the Rotary Club of Cleveland, starts today (July 4th) and ends on Sunday, July 7th. 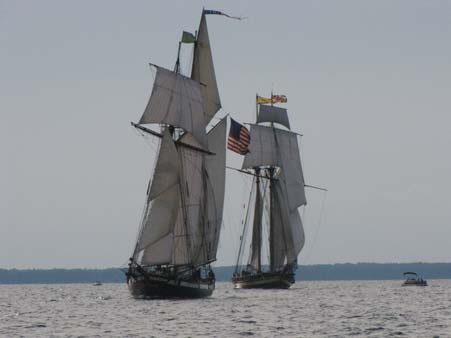 We have some new ships joining out fleet, Denis Sullivan and Appledore IV. 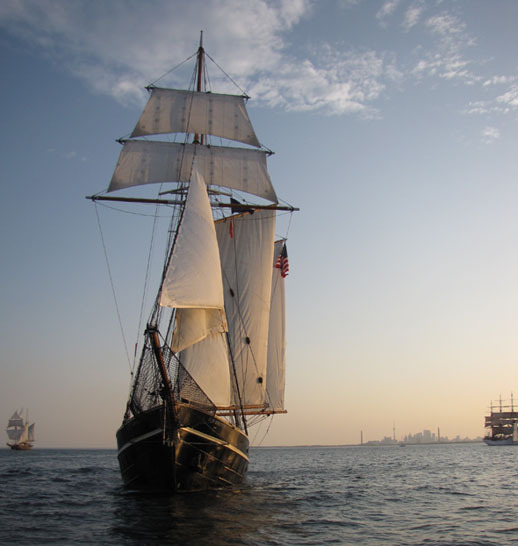 They join Peacemaker, Sorlandet, Pride of Baltimore II, Lynx, Unicorn, Pathfinder, Playfair and Liana’s Ransom. I had to drop my cookie to shoot the cannon! Sacrifices were made on the race committe boat Monday evening as the skipper of our 41′ ketch on the pin end of the line scrambled to keep up with the starting sequence. The cookie was still edible and the start went off with out a hitch. In fact, it was an awesome start with Lynx and Pride of Baltimore 2 both over the line within a minute of the starting cannon being fired. Lynx blasted the race committe boat and we were once again close enough to hear the water slapping the hull of “America’s Privateer”. 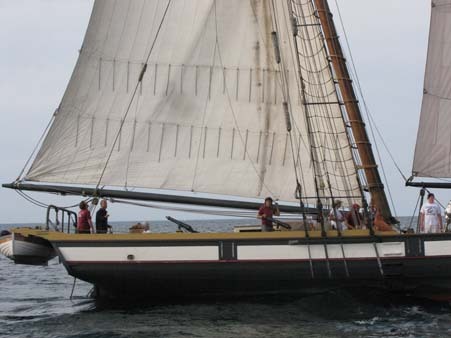 Unfortunately, Lynx couldn’t race for long and soon retired from the race and headed back down to Toledo, Ohio for a weekend festival, leaving Pride of Baltimore 2, Pathfinder and Denis Sullivan on their own. Earlier that day, Roald Amundsen and Europa had started the race together and slowly made their way north to Drummond Island. Both of them also retired early due to weekend commitments. Regardless, Pride of Baltimore 2 and Pathfinder both persevered and finished the race, with Pride of Baltimore crossing the finish line 13 hours ahead of Pathfinder. Final standings are still to be determined, however. These vessels are all handicapped to accomodate thier different rig types so who wins on the water could very well be different once thier Time Correction Factor is figured into the mix. 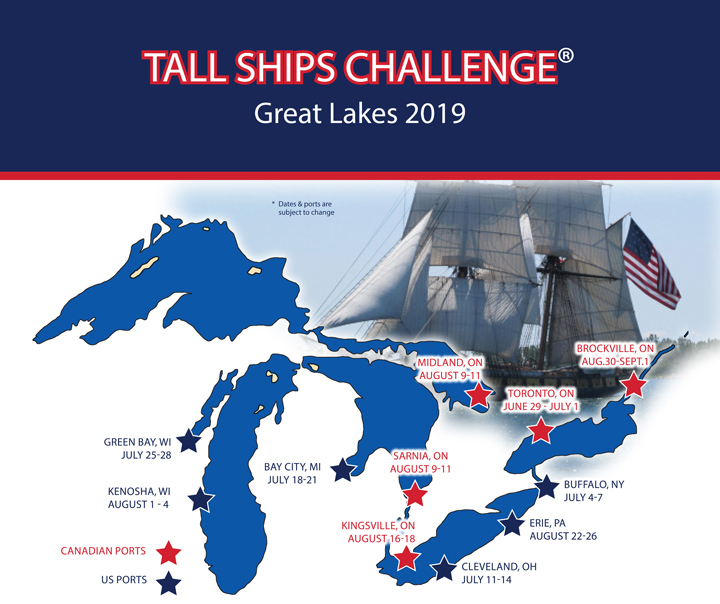 And that is exactly what happened on Sunday night after the winners for the first race from Cleveland to Pelee Passage were announced. Everyone knows that Pride of Baltimore is a fast ship. Baltimore Clippers were built for speed, at first built for moving highly perishable cargo and then later built as privateers during the American War of Independence and War of 1812, fast enough to evade the British naval vessels. With their raked masts and sharp hull, Lynx and the Pride of Baltimore just look sleek and fast (another reason why it is so exiciting to have both Lynx and Pride in the races this year, serious competition!). 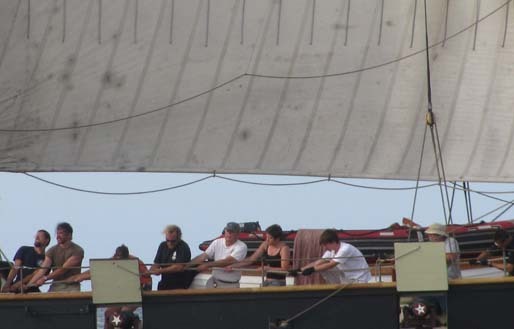 However, while everyone was looking at the Clippers, no one was watching the “briglette”. The dark horse of Race One was St. Lawrence 2 out of Kingston, Ontario. 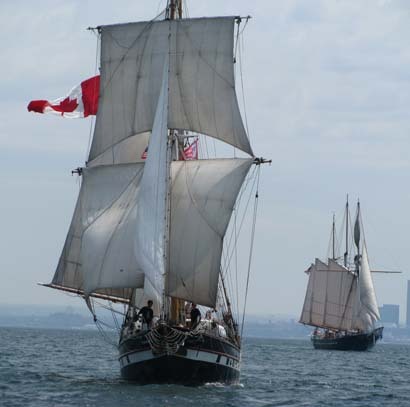 With a sparred length of 72′ she is brigantine similar to the Toronto-based brigantines, Pathfinder and Playfair (hence the “briglette”). 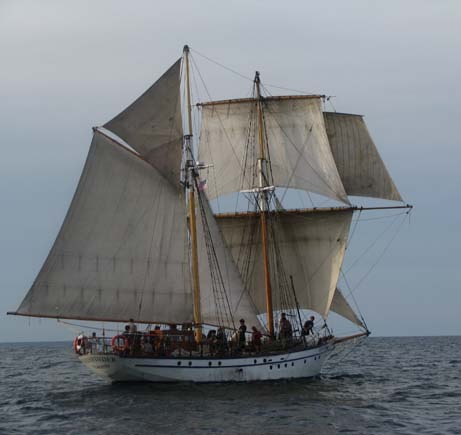 Like Pathfinder and Playfair, St. Lawrence 2 is a youth sail training program with the captain usually the only adult on board. Our very own Libby Drew is a crew member on board when she’s not interning with the ASTA race team. When the final results were all tallied and the handicaps factored in, St. Lawrence 2 ended up the winner of race one, beating out Pride of Baltimore 2 and Appledore V.
We might have won the race. At least after twelve hours of sail handling – tacking, wearing, and setting and striking almost all of Europa’s sails – it feels like we should have.